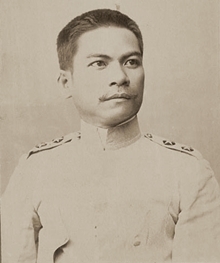 About the author: Venancio Concepcion, Major General in the Philippine Army under the First Republic; served as Councilor representing Capiz in the Federal State of the Visayas; represented Iloilo in the Malolos Congress; appointed military commander of Pampanga by Gen. Aguinaldo in 1898. Surrendered to American forces under Gen. Peyton C. March in Cayan, December 5, 1899. Thereafter served as Deputy Collector of Internal Revenue, and was appointed President of the Philippine National Bank under the auspices of Speaker Sergio Osmeña, and later published La tragedia del Banco Nacional Filipino in 1927 as a defense of his leadership of the bank. About the diary: The entries here are extracted from Maximo M. Kalaw’s The Development of Philippine Politics which in turn cites “the diaries entitled Apuntes y Diario de Operaciones sobre la guerra Hispano-Filipino-Americana.” In a footnote on p. 255 of his book, Kalaw says, “These Apuntes are still in MS. form but copies of them have been made and the writer is keeping one of them.” The manuscript, in turn, is listed in the catalog of the library of Kalaw which was prepared before World War II by E. Arsenio Manuel and mentioned in his article, “Teodoro M. Kalaw’s Collection of Revolutionary Notes,” which appeared in Vol. 48, No. 3 (2000) of Philippine Studies.